Update: This review has been updated to include the addition of the Sense Companion - read on to find out how we found it. HTC has priced the U Ultra at the top end of the market, at a whopping $749 (£649/AU$1,199). That’s quite a step up from the HTC 10, which at the time of the U Ultra's launch was going for $599 (£500, AU$1,099), and currently retails for £470 / $400 / AU$1099, or less when there's a sale on. It puts the HTC U Ultra in a similar price bracket to the iPhone 7 Plus, which is the most expensive of Apple’s line of phones. The U Ultra came to the UK on March 1, and you can buy it directly from HTC. In the US it began shipping in mid-March, while Australia saw a release on March 8. 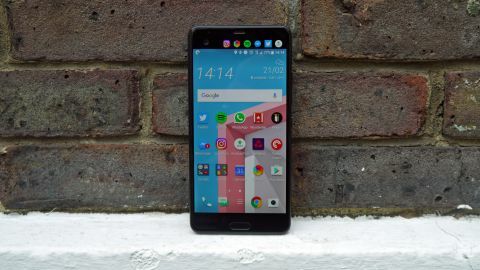 Since release, the price of the HTC U Ultra has dropped a little, and it can now be found for around £549 in the UK SIM-free - and has seen even heavier reductions around Black Friday, going for as little as £300 from some retailers. Since launch, HTC has added its ‘Sense Companion’ software to the U Ultra, promising to suggest useful information based on your daily usage. The Sense Companion can monitor your weight, activity, usage patterns and more, with the user having a fine degree of control over how much it can actually ‘see’. Going the whole hog and giving all of your info can involve reminders to take an umbrella if it is due to rain, information about nearby restaurants if you’re out at lunch, reminders to charge your phone in the evening and more. Crucially, the Sense Companion never ‘speaks’ to you, instead - like the rest of HTC’s software - it attempts to fill a gap not taken by Google, giving reminders in writing. In day to day use, the notifications proved to be only somewhat useful (though this is true of all digital assistants), often missing the mark entirely. They display in the same way as the Facebook Messenger ‘chat heads’, a small bubble taking up a part of the screen. HTC U Ultra users also have the option of displaying the notifications from the Sense Companion on the small secondary screen - that is if they choose to keep it enabled. By far the best tie in is with HTC’s Boost+ app, the Sense Companion will monitor your RAM and battery usage and offer to clean up unused caches and stop power-hungry apps on the fly. But this isn’t something that happens all the time, and this inconsistency can be a problem. In theory, this could be a very powerful tool. Boost+ has an array of granular options over how apps in the foreground and apps in the background can perform, even allowing app by app control. In theory, using this regularly could see battery life increase considerably, though it will depend massively on individual usage. Still, for everyone who has ever had a mysterious Android program such as ‘Media Browser’ eat up an unconscionable amount of battery, it could be a life-saver. As HTC continues to update the Sense Companion, and as it learns more about the user, in time it will likely prove to be a useful value-add-on. The real issue is with relevance - every manufacturer in the game seems to be working on its own digital assistant. Microsoft has Cortana, Google the Google Assistant, Amazon proudly touts Alexa and Samsung flaunts Bixby. All of these companies have more resources and have bigger visions. Whether the Sense Companion will last another year is yet to be seen as HTC insists again that it doesn’t wish to compete directly where Google provides a service better. For the moment, it is not so annoying that it should be immediately dismissed, and that is an achievement in itself. Our main complaint with the design is the weight of the phone – if you’re used to a heavier device, you’ll likely notice how the lack of heft detracts from that premium feel the phone is looking for, though this does make it easier to use one-handed. The brightness is also great on the U Ultra, remaining plenty visible in direct sunlight, while viewing angles are exactly as good as you’d expect from a phone made in 2017.